On his Politics Nation program on MSNBC Monday night, Al Sharpton and his guests discussed what a rumored shake-up in conservative talk radio would mean for President Obama’s agenda, going forward. Sharpton was reacting to a story in Politico that said that Cumulus Media, the second largest radio broadcaster in the country, might drop Rush Limbaugh and Sean Hannity from its stations at the end of the year. Liberals took the story as factual evidence of the shrinking influence of Limbaugh and Hannity. They largely ignored the fact that this was more likely a negotiating tactic on the part of Cumulus, which has to pay to carry the popular conservative talkers, and whose primary interest is in reducing costs and increasing profits. If Limbaugh and Hannity weren’t profitable for Cumulus, their programs would have been dropped long ago. Sharpton contributed to this inaccurate narrative by saying that Obama might be “closer to winning the fight for ideas in this country,” thanks to Cumulus’ decision to drop Limbaugh and Hannity. 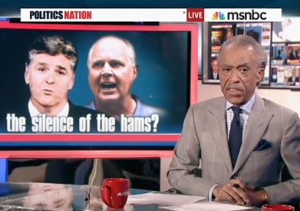 MSNBC contributor Joy Reid mentioned that Limbaugh and Hannity had suffered an advertiser exodus because of their controversial remarks, even though many of the advertisers have been replaced by other companies who covet the Limbaugh/Hannity audience. Media Matters’ David Brock chimed in that he expects that Limbaugh will lose the 40 markets that were mentioned in the Politico story, calling it a “victory for progressives” and an “epic failure” for Limbaugh. What Sharpton, Reid and Brock didn’t mention was that even if Cumulus dropped Limbaugh and Hannity from its network, they won’t be gone from those markets. Premiere Radio Networks, which distributes the programs, is a subsidiary of Clear Channel Communications—the largest radio station operator in the country—and the programs would simply relocate to those stations. The bottom line is that Limbaugh and Hannity are two of the most popular and profitable radio talk-show hosts in the country. If Cumulus executives decide to drop them, that’s a business decision based on cost, not politics. For liberals who hope that Cumulus goes through with their threat, it would be a short-lived euphoria, as the network would likely replace Limbaugh and Hannity with less expensive conservative hosts like Mike Huckabee, or Mark Levin, who also haven’t been shy in their criticism of the Obama administration.